Kendall Toyota used car center is pleased to offer This 2008 Toyota FJ Cruiser comes with a CARFAX Buyback Guarantee, which means you can buy with certainty. The Toyota FJ Cruiser offers a fair amount of utility thanks to its advanced features and unique styling. It's also quite sporty, and injects an ample amount of handling chutzpah into the ridin'-high body of a family-friendly SUV. This vehicle comes with 4WD for better traction on unstable surfaces, like snow and dirt to give you the edge over anything you might encounter on the road. It's not often you find just the vehicle you are looking for AND with low mileage. This is your chance to take home a gently used and barely driven Toyota FJ Cruiser. More information about the 2008 Toyota FJ Cruiser: IntelliChoice rated the 2007 Toyota FJ Excellent for its predicted five-year cost of ownership, so the little-changed 2008 FJ should follow that trend. The FJ Cruiser evokes fond memories of a tough-as-nails truck, though now buyers get amenities that make it a bit more civilized. The combination of Toyota's bomb-proof 4.0L V6, rugged off-road capabilities with 9.6 inches of clearance, surprisingly good highway presence, comfortable interior, and competitive pricing make the FJ Cruiser a smart alternative to offerings from Jeep and Hummer. This model sets itself apart with Rugged off-road prowess, excellent NHTSA ratings., roomy interior for people and cargo, distinctive styling recalls past FJs, and Toyota reliability Located next to the foot bridge on Good Pasture Island Road, come see us at Kendall Toyota Used Car Center. Kendall Toyota used car center is pleased to offer This 2018 Toyota C-HR comes with a CARFAX Buyback Guarantee, which means you can buy with certainty. On almost any road condition, this Toyota C-HR XLE offers solid performance, reliability, and comfort. Stylish and fuel efficient. It's the perfect vehicle for keeping your fuel costs down and your driving enjoying up. The Toyota C-HR XLE will provide you with everything you have always wanted in a car -- Quality, Reliability, and Character. Located next to the foot bridge on Good Pasture Island Road, come see us at Kendall Toyota Used Car Center. Kendall Toyota used car center is pleased to offer This 2011 Toyota Highlander comes with a CARFAX Buyback Guarantee, which means you can buy with certainty. As a compact SUV, this vehicle packs all the performance of a full-size into a package that easily navigates the urban terrain. This Toyota Highlander Limited comes equipped with 4 wheel drive, which means no limitations as to how or where you can drive. Different terrains and varying weather conditions will have no effect as to how this vehicle performs. It's not a misprint. And the odometer isn't broken. This is a very low mileage Toyota Highlander. A rare find these days. More information about the 2011 Toyota Highlander: The 2011 Toyota Highlander is still seen as one of the best combinations of an SUV and sedan available in the United States. Offering seating for seven adults, the Highlander is surprisingly versatile. When properly equipped, the upper-end Highlanders can tow up to 5,000 pounds. MSRP starts at $27,390. Estimated mileage is 20 mpg city and 27 mpg highway for the base 4-cylinder trim. The hybrid version starts at just under $35,000 and is capable of 27 mpg in the city. This model sets itself apart with seating for seven adults, Roomy and versatile interior, V6 towing capability, confident ride, responsive acceleration, and hybrid availability Located next to the foot bridge on Good Pasture Island Road, come see us at Kendall Toyota Used Car Center. Kendall Toyota used car center is pleased to offer Your buying risks are reduced thanks to a CARFAX BuyBack Guarantee. If you're in the market for an incredible SUV -- and value on-the-road comfort and manners more than ultimate off-road prowess or tow capacity -- you'll definitely want to check out this Toyota C-HR XLE. This wonderfully fuel-efficient vehicle offers a supple ride, quick acceleration and superior styling without sacrificing MPGs. There are many vehicles on the market but if you are looking for a vehicle that will perform as good as it looks then this Toyota C-HR XLE is the one! Located next to the foot bridge on Good Pasture Island Road, come see us at Kendall Toyota Used Car Center. Kendall Toyota used car center is pleased to offer CARFAX BuyBack Guarantee is reassurance that any major issues with this vehicle will show on CARFAX report. If you're in the market for an incredible SUV -- and value on-the-road comfort and manners more than ultimate off-road prowess or tow capacity -- you'll definitely want to check out this Toyota RAV4 XLE. No matter the weather conditions or terrain, this Classic Silver Metallic AWD Toyota RAV4 handles with an elegant confidence. Fine interior appointments complement this vehicle's unprecedented performance. The RAV4 XLE is well maintained and has just 32,183mi. This low amount of miles makes this vehicle incomparable to the competition. More information about the 2015 Toyota RAV4: The RAV4 was one of the first modern crossover utility vehicles and since its redesign in 2013, it's been a better fit for the habits of its most common buyer-- families who want a fuel-efficient, reliable, easy-to-park vehicle. A capable all-wheel drive system makes the RAV4 a smart pick for those needing to commute through snowy winters or a trip to the mountain. Strengths of this model include Roomy interior for a compact SUV, capable all-wheel-drive system, safety features, excellent connectivity and audio systems, and fuel-efficiency Located next to the foot bridge on Good Pasture Island Road, come see us at Kendall Toyota Used Car Center. Kendall Toyota used car center is pleased to offer CARFAX BuyBack Guarantee is reassurance that any major issues with this vehicle will show on CARFAX report. This Toyota 4Runner SR5 defines excellence in an SUV. It has the convenience of limitless boundaries paired with city sophistication. Want to brave the road less traveled? You'll have the 4WD capabilities to do it with this vehicle. More information about the 2012 Toyota 4Runner: The Toyota 4Runner debuted in the U.S. more than 25 years ago. Now in its fifth generation, this midsized SUV uses the same platform as the FJ Cruiser and maintains its truck-like body-on-frame construction. A third row of seats is available and both the second and third rows fold completely flat without having to remove the headrests, providing a cavernous 90 cubic feet of cargo space. The optional sliding rear cargo deck can support up to 440 pounds. Strengths of this model include durability and strength, smooth and comfortable ride, incredible off-road handling and capability, and Great combination of truck-like performance and car-like agility Located next to the foot bridge on Good Pasture Island Road, come see us at Kendall Toyota Used Car Center. Kendall Toyota used car center is pleased to offer This 2018 Toyota RAV4 comes with a CARFAX Buyback Guarantee, which means you can buy with certainty. We at Kendall Toyota Oregon are very meticulous. This hand-selected Certified Pre-Owned vehicle has surpassed our own standards and requirements. The Toyota RAV4 is the benchmark all other SUVs strive to meet. With exceptional power, towing and handling, this SUV can handle anything thrown at it. This AWD-equipped vehicle will handle beautifully on any terrain and in any weather condition your may find yourself in. The benefits of driving an all wheel drive vehicle, such as this Toyota RAV4 XLE, include superior acceleration, improved steering, and increased traction and stability. Located next to the foot bridge on Good Pasture Island Road, come see us at Kendall Toyota Used Car Center. Kendall Toyota used car center is pleased to offer Only the CARFAX Buyback Guarantee can offer you the comfort of knowing you made the right purchase. This versatile SUV is perfect for families or contractors with its oversized cargo area, exceptional horsepower and option upgrades. This vehicle has an added performance bonus: AWD. It improves handling on those winding back roads, and gives you added safety and control when driving through wet and snow weather conditions. The Toyota RAV4 XLE will provide you with everything you have always wanted in a car -- Quality, Reliability, and Character. Located next to the foot bridge on Good Pasture Island Road, come see us at Kendall Toyota Used Car Center. Kendall Toyota used car center is pleased to offer This vehicle is loaded with great features, plus it comes with the CARFAX BuyBack Guarantee. The Toyota Highlander is the benchmark all other SUVs strive to meet. With exceptional power, towing and handling, this SUV can handle anything thrown at it. This Toyota Highlander is equipped with AWD for improved handling. Whether you're faced with inclement weather or just out enjoying the twisting back road, you'll have the grip of AWD on your side. More information about the 2015 Toyota Highlander: The Toyota Highlander is a mid-sized near-luxury crossover competing in a crowded segment where just about every major auto manufacturer has a hat in the ring. What makes the Highlander successful is its blend of technology, convenience and Toyota durability at the right price. With plenty of standard features, plus a bevy of options, all wrapped in an attractive package, the the Highlander stands out in a crowded field. Interesting features of this model are Roomy, good ground clearance, stylish and technology-filled interior, sleek exterior styling, available hybrid power and all-wheel drive Located next to the foot bridge on Good Pasture Island Road, come see us at Kendall Toyota Used Car Center. Kendall Toyota used car center is pleased to offer When you purchase a vehicle with the CARFAX Buyback Guarantee, you're getting what you paid for. Treat yourself to an SUV that surrounds you with all the comfort and conveniences of a luxury sedan. Opulent refinements married with exceptional engineering make this the kind of car you'll want to own for a lifetime. With 4WD, you can take this 2016 Toyota 4Runner to places roads don't go. It's all about the adventure and getting the most enjoyment out of your new ride. Exceptional in every sense of the word, this incredibly low mileage vehicle is one of a kind. More information about the 2016 Toyota 4Runner: The Toyota 4Runner debuted in the U.S. more than 25 years ago. Now in its fifth generation, this midsized SUV uses the same platform as the FJ Cruiser and maintains its truck-like body-on-frame construction. A third row of seats is available and both the second and third rows fold completely flat without having to remove the headrests, providing a cavernous 90 cubic feet of cargo space. The optional sliding rear cargo deck can support up to 440 pounds. Interesting features of this model are durability and strength, Great combination of truck-like performance and car-like comfort, smooth and comfortable ride, and incredible off-road handling and capability Located next to the foot bridge on Good Pasture Island Road, come see us at Kendall Toyota Used Car Center. Kendall Toyota used car center is pleased to offer Drive home in your new pre-owned vehicle with the knowledge you're fully backed by the CARFAX Buyback Guarantee. Sure, every Certified Pre-Owned Toyota is rigorously inspected. However, a Certified Pre-Owned Toyota Highlander LE Plus from Kendall Toyota Oregon offers complete peace of mind. The Toyota Highlander LE Plus offers a fair amount of utility thanks to its advanced features and unique styling. It's also quite sporty, and injects an ample amount of handling chutzpah into the ridin'-high body of a family-friendly SUV. When driving an all wheel drive vehicle, such as this Toyota Highlander LE Plus, superior acceleration, traction, and control come standard. Located next to the foot bridge on Good Pasture Island Road, come see us at Kendall Toyota Used Car Center. Kendall Toyota used car center is pleased to offer This vehicle is loaded with great features, plus it comes with the CARFAX BuyBack Guarantee. This vehicle has surpassed all inspections to achieve Certified Pre-Owned status. This SUV is a great example of beauty and brawn with classic styling and a workhorse power plant. Simply put, this Four Wheel Drive is engineered with higher standards. Enjoy improved steering, superior acceleration, and increased stability and safety while driving this 4WD Toyota 4Runner SR5. Located next to the foot bridge on Good Pasture Island Road, come see us at Kendall Toyota Used Car Center. Kendall Toyota used car center is pleased to offer When you purchase a vehicle with the CARFAX Buyback Guarantee, you're getting what you paid for. Sure, every Certified Pre-Owned Toyota is rigorously inspected. However, a Certified Pre-Owned Toyota 4Runner SR5 from Kendall Toyota Oregon offers complete peace of mind. This SUV is a great example of beauty and brawn with classic styling and a workhorse power plant. Take home this Toyota 4Runner SR5, and you will have the power of 4WD. It's a great feature when you need to drive over tricky terrain or through inclement weather. Located next to the foot bridge on Good Pasture Island Road, come see us at Kendall Toyota Used Car Center. Kendall Toyota used car center is pleased to offer Drive home in your new pre-owned vehicle with the knowledge you're fully backed by the CARFAX Buyback Guarantee. This exceptional 2018 4Runner SR5 has passed the Toyota stringent standards and has been hand-selected to become a Certified Pre-Owned vehicle. The quality of this vehicle will undoubtedly ensure a worry-free buying experience. This Toyota 4Runner SR5 defines excellence in an SUV. It has the convenience of limitless boundaries paired with city sophistication. This 4WD-equipped vehicle will handle beautifully on any terrain and in any weather condition your may find yourself in. 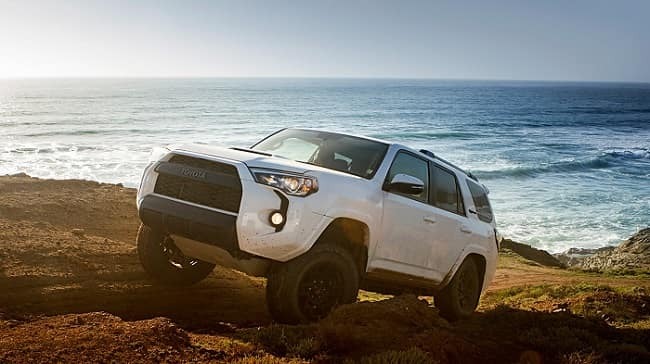 The benefits of driving a 4 wheel drive vehicle, such as this Toyota 4Runner SR5, include superior acceleration, improved steering, and increased traction and stability. Located next to the foot bridge on Good Pasture Island Road, come see us at Kendall Toyota Used Car Center. Kendall Toyota used car center is pleased to offer When you purchase a vehicle with the CARFAX Buyback Guarantee, you're getting what you paid for. Reliability is something you can count on when you purchase a Certified Pre-Owned vehicle like this Toyota 4Runner SR5. Gone are the days of SUVs being the size of a tank and handling like one. This Toyota 4Runner is a perfect example of how SUVs have evolved into vehicles that are as refined as they are rugged. With 4WD, you can take this 2018 Toyota 4Runner to places roads don't go. It's all about the adventure and getting the most enjoyment out of your new ride. Located next to the foot bridge on Good Pasture Island Road, come see us at Kendall Toyota Used Car Center. Kendall Toyota used car center is pleased to offer Your buying risks are reduced thanks to a CARFAX BuyBack Guarantee. This vehicle has met all the exacting standards to be classified Certified Pre-Owned. If you're in the market for an incredible SUV -- and value on-the-road comfort and manners more than ultimate off-road prowess or tow capacity -- you'll definitely want to check out this Toyota Highlander XLE. This Toyota Highlander XLE comes equipped with all wheel drive, which means no limitations as to how or where you can drive. Different terrains and varying weather conditions will have little effect as to how this vehicle performs. This 2017 Toyota Highlander has such low mileage it has been parked more than driven. Located next to the foot bridge on Good Pasture Island Road, come see us at Kendall Toyota Used Car Center. Kendall Toyota used car center is pleased to offer Drive home in your new pre-owned vehicle with the knowledge you're fully backed by the CARFAX Buyback Guarantee. As a compact SUV, this vehicle packs all the performance of a full-size into a package that easily navigates the urban terrain. Simply put, this Four Wheel Drive is engineered with higher standards. Enjoy improved steering, superior acceleration, and increased stability and safety while driving this 4WD Toyota FJ Cruiser . More information about the 2014 Toyota FJ Cruiser: The FJ doesn't try to fit in as a family vehicle, or sacrifice some off-road ability in the name of comfort; its singular focus is ruggedness and trail prowess--and it really looks the part, with its retro-fashionable design harking back to the 1960s-era FJ40 trucks. The FJ's tough, body-on-frame construction means that a few bangs or dents from boulders won't get in the way, while a rugged, straightforward interior design, with water-resistant seats and a rubberized floor, really fits the purpose. Those looking to get not only the most rugged off-road ability but also a more fashion-forward urban look will want to get the Trail Teams Edition. It comes with a 120V power outlet, aluminum sill plates, leather steering wheel and special off-road suspension with Bilstein shocks. Strengths of this model include strong powertrain, Strong off-road ability, rugged and retro looks, all-weather traction, and distinctive Trail Teams Edition Located next to the foot bridge on Good Pasture Island Road, come see us at Kendall Toyota Used Car Center. At Kendall Toyota of Eugene, we know not everyone has a new Toyota SUV in the budget. This is why we carry a large inventory of affordable used SUVs in Eugene. You can shop our assortment of used Toyota SUVs, as well as SUVs from a variety of automakers. With a myriad of options, we’re sure you’ll find something at our used SUV dealership in Eugene that fits your lifestyle and budget. We also serve the Florence, Cottage Grove, and Junction City areas. Not sure what size SUV is best for you? Shop our used SUV dealership today and let our experts help you shop our inventory of used SUVs for sale in Eugene. We have something for every budget, lifestyle, and family size. Are you looking for something equipped to handle tough off-road terrain or just want to easily navigate Oregon winters? Browse our selection of used SUVs equipped with AWD or 4WD that will easily take you anywhere you want to go. If you’re in the hunt for a small SUV, take one of our sporty crossover SUVs for a test drive. We’re sure you’ll love the way they feel. If you need more cargo space for your weekend getaways, a full-size SUV could be just the thing for you. Be sure to browse our 7-passenger SUVs that come equipped with a third row for extra seating, as well. While you’re here, visit our Toyota Finance Center and let our financial experts help you apply for a Eugene car loan. You can also apply for a free car appraisal to find out the trade-in value of your current vehicle by filling out our trade-in form. No matter if you’re in the market for a compact SUV, midsize SUV, or full-size SUV, Kendall Toyota of Eugene is the used SUV dealer you’ve been searching for. Contact us online or come by today to shop our used SUVs in Eugene.